Robert Peterson was born April 21st, 1995 to Bill and Sue Peterson in Sioux Falls, South Dakota. Growing up as the son of parents who were highly involved in the community, Robert developed a deep love and appreciation for history and public service. He carried those interests into his education. At Washington High School in Sioux Falls, Robert was a member of both the football team and the debate team. At the University of South Dakota in Vermillion, he earned a Bachelor's Degree in History and Political Science, with a Minor in Business Administration. He was also highly involved in extracurricular activities at USD. He served on, among other things, the Executive Board of the Student Government Association and his fraternity, Tau Kappa Epsilon. 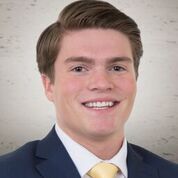 Since graduating from the University of South Dakota in 2017, he has worked professionally on two statewide political campaigns. As for the future, Robert currently resides in his hometown of Sioux Falls, and is in the process of starting a government relations business with his father.